Morf13 started a forum thread examining the handwriting of Zodiac suspect Richard Gaikowski, compared to known Zodiac samples and further analysis of letters composed by Richard Gaikowski, along with his perceived whereabouts in the Zodiac Killer timeline. He is the favorite suspect of Tom Voigt from Zodiackiller.com, who himself provides contribution to this topic. Visit the point of discussion here http://www.zodiackillersite.com/viewtopic.php?f=45&t=370. The latest Zodiac suspect has just been revealed as Earl Van Best Jr, amid a flurry of newspaper and television articles and claimed in a book by Gary Stewart that his father was indeed the infamous Northern California killer. The book has been released by Harper Collins entitled 'The Most Dangerous Animal of All'. However, police seemed to know little, until the publication hit the bookshelves and we will have to wait on the validity of this latest claim. To purchase this book and decide for yourselves, it can be obtained here. In what was dubbed 'The Ice Cream Romance', Earl Van Best Jr appeared in court on a KPIX news report from August 31st 1962, charged for the offence of eloping with a minor, Judy Chandler, aged 13. See video. 'Seagull' opened up a discussion thread on this topic on May 12th 2014, containing all the relevant news links from around the internet. If you would like to join the conversation follow this link to the ZodiacKillerSite forum thread. http://www.zodiackillersite.com/viewtopic.php?f=90&t=1629. To visit 'The Most Dangerous Animal of All' website click here. On December 6th 2013 Craigfitzer started a forum thread asking the question 'Why not Lawrence Kane'. Lawrence Kane was heavily linked to the Zodiac murders, having worked at the Sahara Tahoe Hotel around the same time period as Donna Ann Lass, who vanished from Stateline Nevada on September 6th 1970. This post examines the pros and cons of Lawrence Kane as a viable suspect including photograph comparisons and press cuttings. To post your thoughts on this subject visit here. On February 22nd 2014 Mike Morford, aka Morf13, reignited a thread from his previous forum, concerning a person of interest in the Zodiac case. 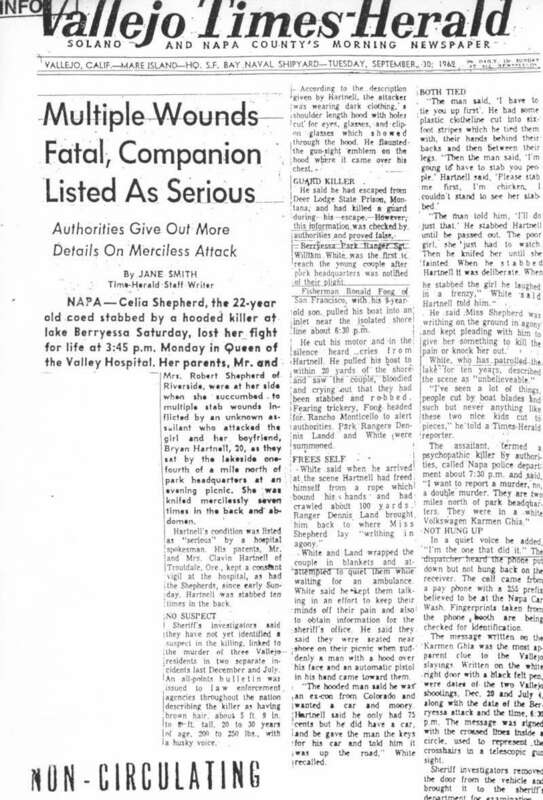 Zodiac Killer Site has in its possession an interesting typed letter from the Riverside City College Library, 4800 Magnolia Avenue, Riverside, California, concerning the case of Cheri Jo Bates, savagely murdered on October 30th 1966 outside the said library. Some of the workers at the RCC had suspicions about Ross Sullivan, based on his character and various circumstantial evidence. Unfortunately for them, their suspect was not apparently held in the same regard by police at the time of Cheri Jo Bates' murder. 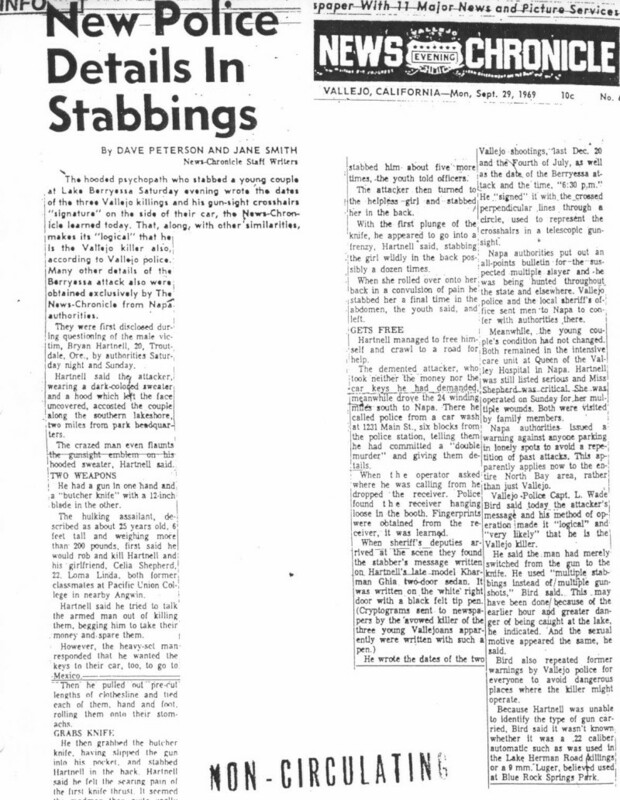 The crime has just past its 50th anniversary, with unfortunately little progress in identifying the killer, or indeed, if it is undeniably linked to the Zodiac case at all. To view this letter in its entirety and follow the discussion on this person of interest, visit ZodiacKillerSite forum. To register at Zodiac Killer Site Forum, click the banner in the sidebar.